Initially planted by the original owners of Rex Hill, Paul Hart and Jan Jacobsen, as Jacob-Hart Vineyard in 1987 this site sprawls across a gorgeous south facing hillside in the central part of the Chehalem Mountains AVA just east of Ribbon Ridge. 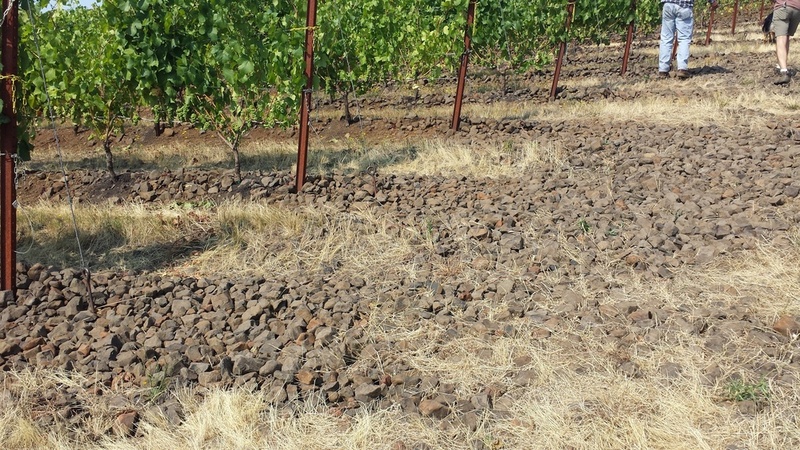 This hillside is unique and where Olenik Vineyard sits is a marine sedimentary soil area that, in parts, is also loaded with a quarry full of softball and greater sized basalt chunks. This is one of the warmer vineyard sites we work with and the farming there has to be very particular and precise to allow the plants to thrive in difficult growing conditions. The results of what comes from here can be spectacular. We receive several blocks at this point and are currently bottling two wines that in very different ways capture the essence of this site. The Anklebreaker Block: This is a 2007 planting of Pommard in the single rockiest section of the vineyard. This looks not un-like many of the vineyards in Chateauneuf du Pape. The wines from this block are prodigious, dark fruited, animalistic and tannic. They are not friendly and easy. They are a pure marriage of plant and soil. Usually we shy away from sections of vineyard that are less than 15 or so years in vine age. We have so much older vine material in the winery it is hard for the younger stuff to fit in let alone compete or stand out and the inconsistent nature of younger vines and the wines they produce is usually something we are not interested in paying for. This block was so completely unique that we snatched it up when it was only in its 5th leaf. We had a feeling this could produce Pinot Noir not only unlike anything in our cellar but something distinct from basically any Pinot Noir produced in this state. In certain years (2011, 2012 and 2017) it has delivered that specialness we were seeking. This is as rare a bottling as we have and it defines the outer limits of our nature at the winery. Wadensvil Block: This is the second oldest section remaining in the site having been planted over 25 years ago in 1991. Dead south facing on one of the gentler slopes in the vineyard, this block has been a mainstay for us since our first vintage with Olenik Vineyard in 2009. There is something about Willakenzie (marine) soil and Wadensvil clone together. They have a sympatico sort of relationship and the wines can be just thrilling examples of Oregon Pinot Noir. The wines are perfumed, red fruit oriented with hints of blacker fruit, gentle in nature but with firm enough tannins for great complexity. While we are only in our 10th vintage with Olenik Vineyard the initial bottling (2009) hints at a longevity that should easily slide past twenty years of bottle age doing the wine justice. A gorgeous and contemplative site just a few miles east of the winery.